The sharing economy continues to transform the way that people get around: there are lift-sharing apps, carpools for cargo, and now Scooterino is the first carpool for scooters, connecting those in need of a ride with scooter drivers heading in the right direction. 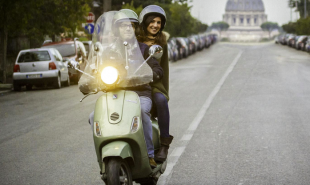 Scooterino, based in Rome, follows the Uber business model: users begin by downloading the app and creating an account. Then, they enter their desired journey and the app offers up a potential ride with a price quote, arrival time and the driver’s details. 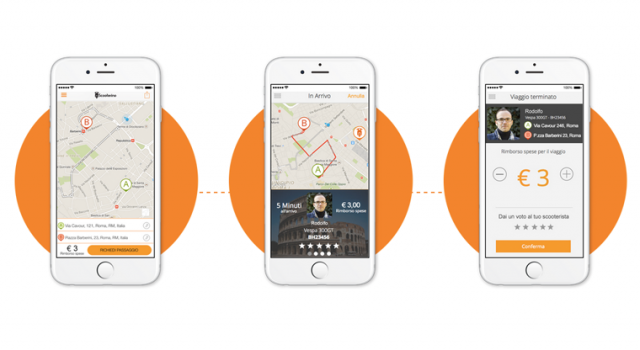 If the user accepts the ride they are collected at the arranged spot and pay for the service on arrival through the app’s secure payment server. All users are encouraged to review their respective driver and passenger ratings are displayed on their profiles. Scooterino rides are an excellent option for individual passengers: they usually cost only slightly more than the equivalent bus fare and they are eco-friendly, helping to reduce carbon emissions and traffic congestion. The start-up has already signed up over 2000 members and is rewarding those who get on board with a free first ride. Could the platform work in other cities?